Dog lovers will beg for these fun glasses featuring their breeds signature characteristics. In the mood for a single malt bourbone? Or maybe a refreshing Arnold Pawlmer? 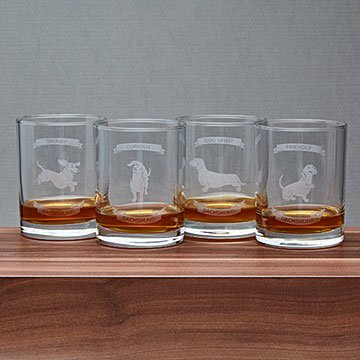 Whatever you're drinking, dog lovers will beg for these fun yet sophisticated glasses that capture their breed's spirit. One is etched with the breed name, and the other three with characteristics they're known for: "Smart" corgi, for example, is wearing a graduation cap, and "Affectionate" corgi is looking, well, downright adorable. Give the set to your pal who's still trying to teach their pooch how to "cheers!". Made in the US. Also check out our Dog Spirit Single Glasses. These are much better than the ones that come with the box sets of bourbon. We are giving this to a family with a Dachshund named Daisy, who took over everyone's hearts, and everyone's sleeping schedules. The glasswares are beautiful look at, solid to hold, reasonable price, custom-made to the dogs the gift receivers. Clever design and unique. We also like the company shipping schedule - clearly stated, and arrived on time as stated.